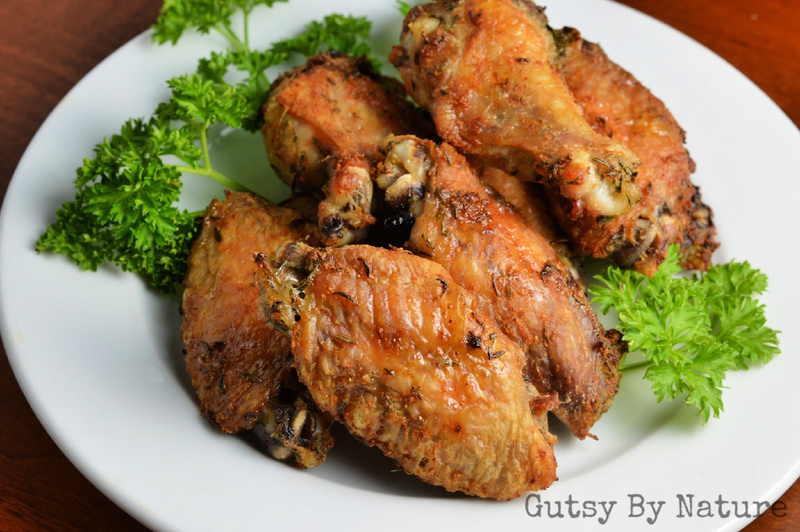 I'm sharing all my secrets in this recipe for extra crispy chicken wings! The base recipe is AIP-friendly but feel free to play around with other seasonings. Everyone will love this one!! If wings are not already separated into flats and drumettes, do so now with a sharp knife. Not sure how to do this? See directions here. Reserve the wing tips for future broth making. Preheat oven to 375° F. Place an oven safe wire rack over top a baking sheet large enough to hold all wings. Combine baking powder, salt, and seasonings. Place this mixture along with wings into a zip-top bag or other large container like a bowl that has a lid. Shake vigorously so that wings are evenly coated in the baking powder and seasoning mixture. Spread onto rack, taking care that the wings do not touch other. After 40 minutes of baking, increase temperature to 425° F and set a timer for 10 minutes but do not open oven door. After 10 minutes, remove pan from oven and use tongs to carefully flip each wing. Skin may stick slightly to the rack as you do so, try to lift gently so that this is minimal. Return to oven and bake for 10 more minutes. Serve with your favorite dipping sauce, if desired.